This was a major year for Crystal and the industry—the company updated the corporate appearance to better reflect the 30 years of dedicated experience creating reliable solutions wherever content flows, all with an eye to our future role. The company name was changed from “Crystal Solutions” to simply “Crystal” and the logo was update, as well as the firm’s website and product suite. This new look debuted at Satellite 2015 in March and solidified our position as an established and proven industry leader. 2015 has seen a number of standards come into force, creating challenges and new opportunities for the industry. The SCTE-35 standard for metadata became a requirement. Beyond simple insertion, metadata must be handled in a specific way to adhere to the standard. The biggest challenge to metadata use is the confusion as to what the standard actually means. Crystal worked with clients to help them understand exactly how the SCTE-35 standard affects them, including the presentation of a webinar in partnership with SatNews about how to ensure compliance and proper use of the standard. 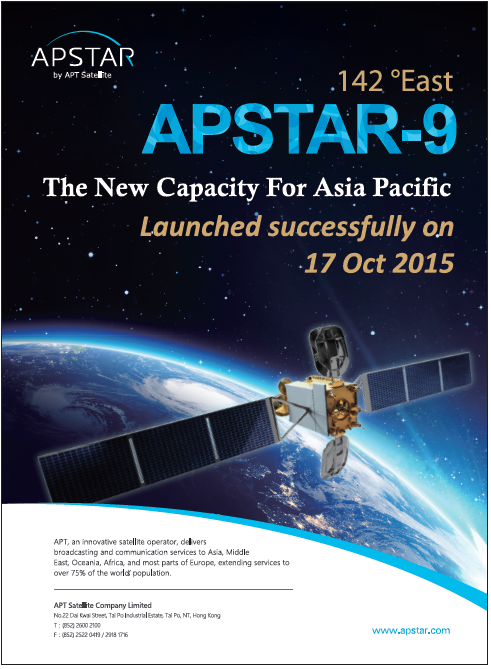 The other requirement for the satellite industry is Carrier ID (CID). In January 2015, all satellite operators were required to initiate implementation of CID, according to the resolutions issued by the World Broadcasting Union’s International Media Connectivity Group (WBU-IMCG). Uplinkers must ensure CID support is specified in all requests for proposals for any SCPC and MCPC video and data. New modulators or single thread encoders for video uplinking must have CID support that meets the ETSI standard according to the resolutions. US broadcasters are working toward next year’s FCC deadline of June 1 for CID to be required for all SNG/Flyaway broadcast platforms. For CID, the ability to transmit is only one piece of the puzzle—CID must also be detected. Satellite operators must ensure proper implementation of CID across their networks and have the ability to detect the ID, especially when errors occur. Crystal worked with a number of broadcasters to ensure they are transmitting the correct ID, which is particularly important for those uplinkers that move or reconfigure carriers routinely. A radical shift is underway that impacts the broadcast industry and the way content is consumed. Consumers expect content they want, where they want it and broadcasters are under increased pressure to deliver content to multiple platforms to remain competitive. Crystal developed new technology to keep customers ahead of this curve. I have long said, and our company’s success is rooted in the fact, that automation is key to reducing the burden on the operator. At Satellite 2015, we launched the latest release of our Logic automation solution, ensuring faster resolution of faults and adding simpler configuration through a user-friendly editing interface. Metadata is a key way to remain competitive, enabling broadcasters to increase service value and generate new revenue and business models. In July, Crystal made the shortlist for the CSI awards for our Video Metadata Analyzer (VMA), which is used to view, describe, and correlate the presentation of program content based on included metadata. One of the challenges for video content providers is that it is not easy to determine whether Metadata is present and used correctly in each transmission path. Crystal VMA extracts metadata messages, analyzes them and logs the metadata in detailed human-readable and machine-readable formats. I was honored to receive the Patriot’s Award this year for Crystal’s support of Jason Chatham, our Vice President of Professional Services, Deployment. The Patriot’s Award recognizes organizations for their support for National Guard and Reserve members in their role as both a service member and an employee, relieving them of monthly obligations by allowing them time off as needed and providing assistance upon return to civilian life. This year we established meaningful partnerships to improve the experience for our customers. We worked with a number of companies, including AVCOM, opXL, Seldon Systems and Actus. All have complimentary solutions, enabling the company to present end-to-end offerings to customers. Crystal looks forward to an exciting 2016. A number of deadlines are approaching for Carrier ID implementation and changes for the broadcast industry will continue to accelerate. Broadcasters are reaching out to discuss solutions for flowing content to multiple screens. Crystal continues to innovate our platform to support customers with solutions and we look forward to helping them successfully navigate the challenges yet to come. For DataPath, Inc., 2015 was a rewarding year during which we saw our commitments to exceptional customer care, product innovation and engineering quality lead to demonstrable growth. This year, DataPath’s leadership focused on investing in and repositioning the company for market expansion. To that end, all of the company’s primary lines of business were challenged to advance existing technologies and launch new products and services. DataPath achieved several milestones that demonstrate how the company has succeeded in leveraging new leadership and financial backing as well as 25 years of expertise to introduce to the market unique solutions designed to satisfy emerging communications requirements. At DataPath, we like to say the range of solutions we provide spans from Terminals to Teleports to All the Tools in Between. The value proposition the company offers is being able to provide end-to-end remote communications and networking solutions accessible through one common interface and architecture. Bearing that in mind, the company is especially proud that three major product and service launches were executed in 2015 that represent different parts of a total network solution. DataPath has been providing customized information assurance and cyber security services to commercial and government customers for many years. Historically, DataPath’s cyber security services have been primarily focused on protecting satellite and fixed wireless networks, which typically employ specific devices, such as RF units and modem technologies, that present unique vulnerabilities. Recognizing a need, DataPath packaged and expanded its core Cyber Security competencies and launched our packaged Cyber Security Solutions. These solutions are tailored to address the aforementioned unique vulnerabilities of satellite networks, yet they can be used to protect business networks of all kinds. These Cyber Security Solutions use state-of-the art tools to assess a communications network’s infrastructure, identify vulnerabilities, and create a customized security plan. The solutions are available in three easy to understand packages, known as Essential, Assurance and Vigilance. The services range from basic assessments, to supporting the customer’s existing IT staff to ongoing 24/7 support and incident response. Additional services include network certification and accreditation, compliance assurance, and post incident investigation. The company also launched a related Managed Security Service Provider Program with the build out of a new 24/7 Cyber Security Operations Center (CSOC). Through the new Managed Security Services, small- and medium-sized businesses will be able to offer their customers enterprise-level security. In September, DataPath launched MaxView® Enterprise™, a major enhancement of the company’s renowned network monitor and control software. Hundreds of commercial customers including leading satellite operators and broadcast organizations already rely on MaxView to monitor and control all of the disparate systems and multi-vendor devices on their network through a single user interface. Now, by employing a high-performance, mobile responsive web platform, MaxView Enterprise customers can securely manage their networks from virtually any web-enabled device. In addition, MaxView Enterprise offers substantial upgrades to the software’s analytics capabilities with enhanced reporting and customizable dashboards for a comprehensive overview of clients’ entire networks on one screen. The new interactive reporting feature allows operators to fine-tune their results in real-time to achieve a greater understanding of key performance indicators (KPIs). Other significant enhancements include a cutting edge user-interface, advanced scheduling capabilities, automation of complex service tasks, and an expanded library of device drivers to support remote sensors and additional appliances. MaxView Enterprise also includes built-in continuous learning, through integrated multi-media training, to ensure that users can solve complex problems with their systems easily and methodically. The user-interface based support capabilities are customized to each network and provide varying levels of help ranging from detailed workflow procedures to interactive tutorials. Another significant milestone for DataPath in 2015 was the launch of its QCT90, an new lightweight, man-portable satellite terminal that is 90 centimeters in diameter and weighs only 20.6 kilograms. The man-portable terminal allows for a single person to carry and quickly set-up and deploy. The QCT90 provides news crews and first responders reliable, high-performance satellite communications capabilities when their missions call for quick connectivity on the go. They can take the antenna out of its backpack or case and establish network connectivity in less than three minutes while other products on the market might take half an hour. The product officially debuted in the fall of 2015 and scale production will start in early 2016. 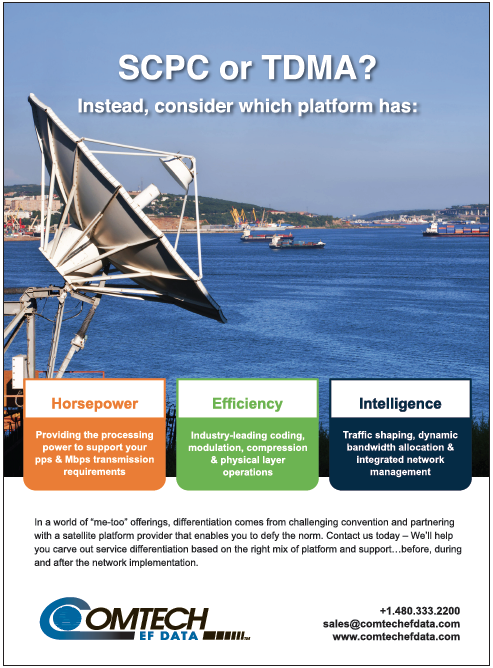 As new high-throughput and next-generation satellites increasingly become a reality, DataPath will continue to leverage its long heritage of engineering innovation to develop robust products that help satellite network service providers best take advantage of the promise of those fleets. The company will also focus on growing and strengthening its Cyber Security and Managed Security Services, developing a broader range of antenna offerings aimed at broadcast and commercial customers, developing Communications on the Move (COTM) products, and increasing partnership with satellite network service providers specializing in the oil and gas, mining, construction, maritime, and aerospace sectors. We have already shifted our thinking around product development to a multi-modal mindset and continue to position ourselves to offer satellite communications technologies that can switch between other forms of telecommunications. The quality of RF signal transmission within satellite communications and broadcast applications is one of the key ingredients to delivering uninterrupted service, with no single point of failure. Successful conception and implementation depend on the know-how of the system integrator and the technical capabilities of the RF transmission solutions provider. 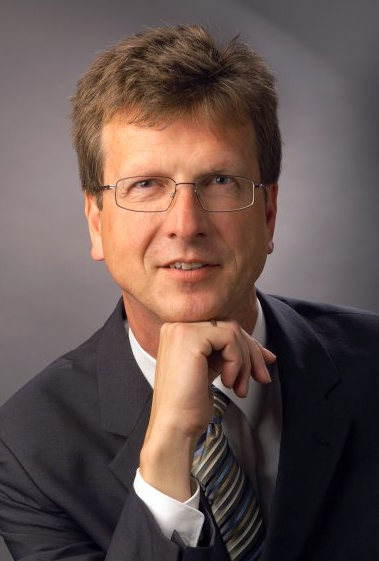 Last, but not least, this always depends upon the quality of collaboration between the two, said Jörg Schmidt, Managing Director of DEV Systemtechnik GmbH & Co. KG. At DEV Systemtechnik, a Quintech Company, 2015 has been a time to continue preparing for technological advances and industry changes as well as a time for extending the company’s global reach and reputation in the RF transmission sector: “From Dish to Rack and Back.” The company has invested in targeted offerings for RF-over-Fiber and RF-over-Coax to meet the needs of broadcast, cable and satellite customers alike. Customers demand superior and high quality products and also expect professional advice in serving their individual needs as well as expert advice and experience when addressing their technical and business challenges. The work of DEV’s skilled and experienced team, combined with a thorough knowledge base in these domains (SATCOM, telecommunications and RF signal handling) is an asset the firm has been able to bring to the front-line with customers in order to maximize their satisfaction of provided services and product. This is why customers that rely on DEV solutions include some of the world’s most demanding systems integrators, communications providers and broadcasters. Many new products and solutions have been launched during the last 12 months and DEV will continue to do so throughout 2016. During 2015, the joint Quintech/DEV Matrix Concept “Expansion by Reduction” has gained industry wide acceptance. In today’s environment, organizations continue to face ever-increasing demands for bandwidth, content distribution and data processing. Convergence of all forms of content delivery is at our doorstep. Most facilities are feeling the pressure to manage operating expenses, demanding increased energy efficiency and decreased RU footprint. This has never been more important. Next Generation RF Matrix Switches, such as DEV’s ARCHIMEDES or Quintech’s XTREME 256, offer an exciting opportunity for the satellite industry to refresh legacy L-band matrices and greatly increase operational capabilities, all the while vastly reducing power requirements, cabling and rack unit footprints. ARCHIMEDES was launched at the IBC 2014 and is the benchmark in performance, size and price. ARCHIMEDES is stronger than all other RF Matrices regarding the RF performance and is smaller, providing 64 x 64 connections in 4 RU. The product is smarter, with many unique features and redundancy options. The features of the L-Band Distributing Matrix ARCHIMEDES (DEV 1986) give customers the best flexibility and reliability available. The concept of the Matrix is an all-in-one design that makes operations in cable, satellite, and broadcast facilities as efficient as possible. The sales of the L-Band Matrix Switch ARCHIMEDES in 2015 topped our internal expectations by far. Many leading broadcasters selected the DEV solution to upgrade their teleport or IPTV facilities in Africa, in Russia, in the Middle East and Central Europe. Similar success with the 8² Matrix could well be experienced during 2016. At IBC 2015, DEV introduced the 8² Distributing Matrix. With this launch, Quintech/DEV’s Matrix product family now offers a full range of next generation RF matrix switches, all designed to meet a variety of operator’s needs, from the small to the extremely large projects. For small configuration environments, such as SNG vehicles, the compact 8² Distributing Matrix offers an ideal mix of cost and performance as well as unique advantages such as optical inputs, unique redundancy options, LNB powering, full color display user interface, and dual redundant field replaceable power supplies. For new ground facility and green-field builds, for example, to serve High Throughput Satellite (HTS), where requirements can exist to switch between multiple RF paths, these new RF matrices also provide the greatest efficiency. If your mission critical RF Transmission System fails, severe consequences and higher costs can result. Therefore, redundancy, which ensures that your RF Transmission System operates without interruption, clearly pays for itself. In response to market demand, the company launched a new Universal Switch DEV 1953 in the autumn of 2015, thereby extending DEV’s Redundancy Switch product line. The DEV 1953 offers broadcasters a higher capacity solution designed to make network resiliency and redundancy easier than ever for larger network applications. DEV’s Redundancy Switch Solutions eliminate single points of failure and enable the highest uptime for customer networks. The flexible solution is available as a 16 Slot version for large RF transmission applications and as a 2 Slot version designed for small RF transmission applications. What differentiates DEV and Quintech from other solution providers is that we have these products and incorporate additional features into the offerings, which provide customers with unique and highly flexible solutions. DEV’s RF-over-Fiber saves rack space and also greatly reduces the risk of signal loss, while providing “5 Nines” reliability. The customer also saves money through lower operational, maintenance and purchasing costs. OPTRIBUTION® is very much a “green” solution and is ideal for Ka-band Site Diversity applications that require high network uptime. With a Ka-band Site Diversity configuration, the signal transmission is redirected from the main site to a diverse site in the case of adverse weather conditions. Site diversity configurations can employ DWDM RF-over-Fiber transmission systems and redundancy switching units as well as provide excellent methods to ensure maximum Ka-band system reliability and availability, in spite of any high level of rain attenuation. It is hard to believe that this year we celebrated the 2nd anniversary of Qatar entering the Space Age with the launch of Es’hail-1. August 29, 2013, was a monumental day for Es’hailSat as the world witnessed the successful launch of Qatar’s first satellite, marking the start of the country’s space program. 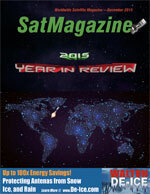 Two years later, the company’s satellite program is on track and 2015 has seen Es’hailSat continue to deliver on the firm’s commitment to become a media leader, a world-class satellite operator and the center of excellence in the region. With the satellite network, the principal aim is to enable customers and stakeholders to substantially increase their broadcasting capabilities and develop a sustainable, national satellite communications sector as part of Qatar’s 2030 vision. The company’s Es’hail -1 continues to go from strength to strength, demonstrating the value of this offering in terms of technical capabilities and performance as well as in terms of independence and the security of content broadcast from this first satellite. In addition to providing transmission for established news, sports and entertainment channels, a growing number of new Arabic channels are selecting Es’hailSat to launch their content in the MENA region. Qatari cultural channel Al Bidda and Al Araby Television Network, a London-based platform for Arab youth, talent, energy and aspirations, recently launched HD channels exclusively on Es’hail-1. With an increased subscriber growth of 34 percent since initiating transmissions on Es’hail-1, beIN Media has just launched new HD entertainment channels as they seek to diversify and expand their audience with new content that includes film, entertainment and TV series such as travel, lifestyle, kids and documentary programming. The plan continues to provide premium satellite capacity in the MENA region with the expansion of the Es’hailSat fleet. In August, the second satellite Es’hail-2’s first significant milestone was completed—Critical Design Review (CDR). This accomplishment allows the spacecraft to move into the assembly phase and to remain on schedule for a Q4 2016 launch. Passing CDR validated that Es’hail-2 will meet the company’s requirements and perform as expected for customers and stakeholders. Es’hail-2 will provide high-quality, premium DTH content across the Middle East and North Africa from the 26 degrees East TV hotspot. In addition, a delegation from Es’hailSat completed a visit to Space Exploration Technologies (SpaceX) in Hawthorne, California, the company selected to launch Es’hail-2. The formal signing of the contract occurred and a review of the high-tech facilities where the Falcon 9 rocket is designed and manufactured was accomplished. business partners. The high-tech teleport will also provide back-up studios for TV channels and serve as a disaster recovery facility for broadcasters. The site will be connected to the key media broadcasters in Qatar by means of a redundant, dedicated fiber optic link. Design for the new teleport is expected to be ready by Q1 2016 and the site build and project completed by Q1 2017. As secure transmissions are of paramount importance in the MENA region, Es’hailSat has continued to work closely with the IRG (Interference Reduction Group), underlining our commitment to reduce and eliminate satellite interference and provide a secure transmission network for our customers. The IRG Group has achieved a number of accomplishments, including the widespread adoption of Carrier ID in time for the 2012 Olympics, which resulted in satellite operators achieving an interference-free Olympics. With Qatar hosting the 2022 FIFA World Cup, the company is undertaking a number of initiatives that include the installation of a Carrier demodulator at the CMC as well as recommending and encouraging customers to use Carrier ID as part of the full cooperation within the IRG community. Es’hail-1 and Es’hail-2 have been designed with the most advanced anti-jamming capabilities to meet the needs of the MENA market. Es’hailSat has, this year, developed a Ka-band hub located in Doha. This hub provides flexibility to service providers and allows them to select a style of engagement and commitment that will best suit their business needs. Through the hub’s high-tech infrastructure, Managed Service Providers (MSPs) can provide telecom solutions that support a range of satellite-based data communications applications, ensuring their customers benefit from flexible and efficient technologies such as compression, WAN optimization and bandwidth optimization for OPEX savings. The main services provided by the new Es’hailSat hub are Internet Services, Telephony Services and Corporate Network Connectivity. In 2015, the generation of awareness continued for the Es’hailSat program through a series of high-profile sponsorships and exhibition presence. In Qatar, transmission coverage of a number of sporting events were sponsored and provided that included the English Premier League on beIN SPORTS and the Qatar Total Women’s Open and the ExxonMobil Men’s Open international tennis tournaments. In the media events sector, the Association of Purposive Visual Media Gathering was sponsored. In September of this year, the company was the recipient of the “Best Stand Award” at the prestigious International Broadcasting Convention (IBC) in Amsterdam, the Netherlands. Es’hailSat’s outlook for 2016 is extremely positive. With Es’hail-1 in operation and the second satellite, Es’hail-2, on schedule for 2016, the company is ideally placed to support the continued growth and expansion of media organizations from the 25.5/25 degrees East broadcasting hotspot by providing premium content, communications independence, quality of service and proven market penetration.